In the constellations, the first word of a sentence is a starburst. From there, every subsequent word juts off at an angle from the previous one, with the angle determined by the part of speech. The length of the line that connects one word to the next is determined by how many letters the initial word has, as is the size of the circle that represents the word. So “matter” is a bigger circle than “to,” and the distance between “matter” and “to” is much longer than the distance between “to” and “us.” The sentences from each chapter, marked with Roman numerals, are laid out in a vaguely clockwise pattern. The sentences themselves are written out at the bottom of the poster. 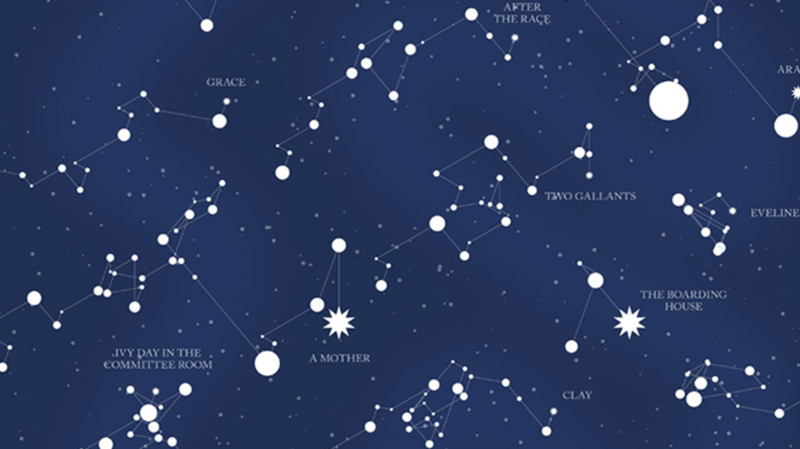 Rougeux writes on his site: “I didn’t intend to create constellations. I just wanted an interesting visual way of looking at text but quickly found that what I was creating resembled constellation maps..." His posters span classic literature, mapping out sentences from Peter Pan, The Picture of Dorian Gray, Alice’s Adventures in Wonderland, and more. The posters start at $28 for a 24-inch by 36-inch print. You can check out his other work on his site.